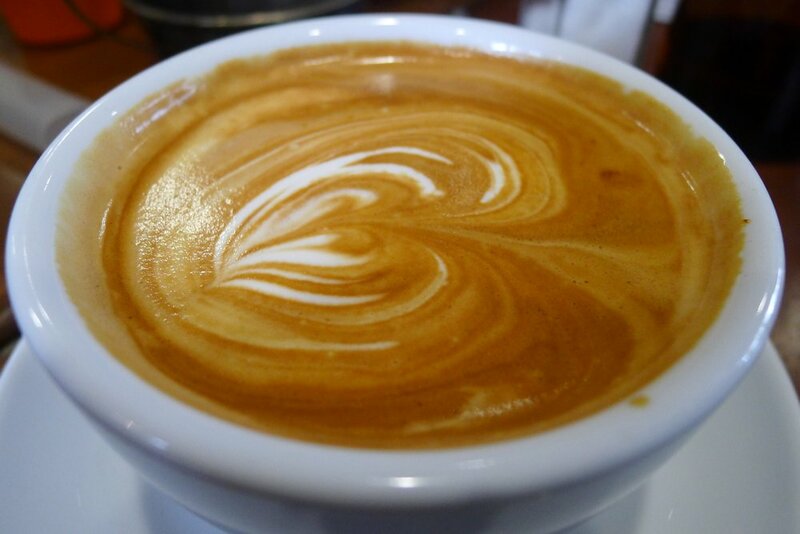 Another day in Surry Hills, another booming café. 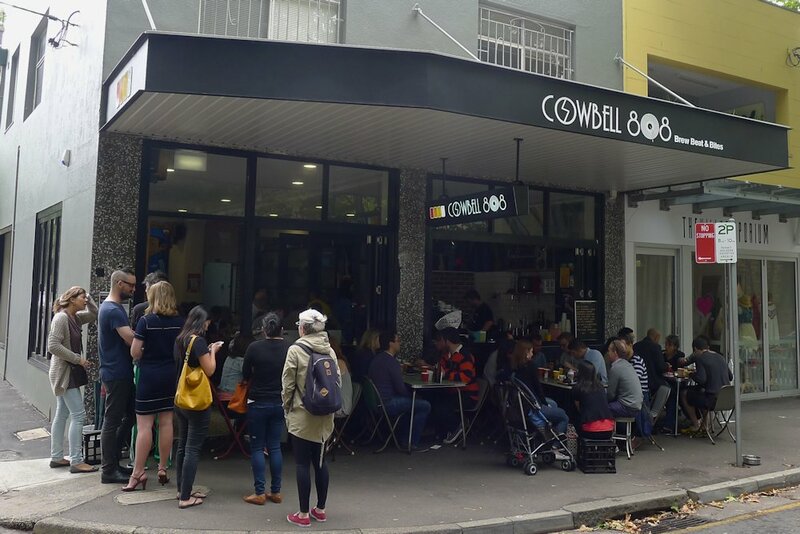 Cowbell 808 is busy for a reason and after visiting it a few weeks ago sans camera, I was keen to return for a review. The menu explains it all but the name is based on the classic TR-808 drum machine. 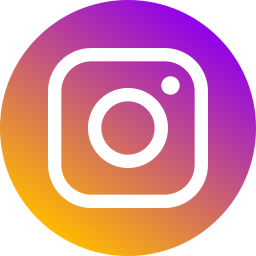 Therefore, no, the café’s logo does not depict iPhones as I overheard one patron comment but rather the buttons on an 808. For anyone who grew up in the 80s, the interior will bring back fond memories: vinyls, rollerskates, boomboxes, Pac-Man, Madonna and Culture Club to name a few. But thankfully it’s all tasteful and not kitsch. The vibe is fun, the waitstaff are on the ball & friendly and the plates that fly by as you wait are positively drool-worthy! 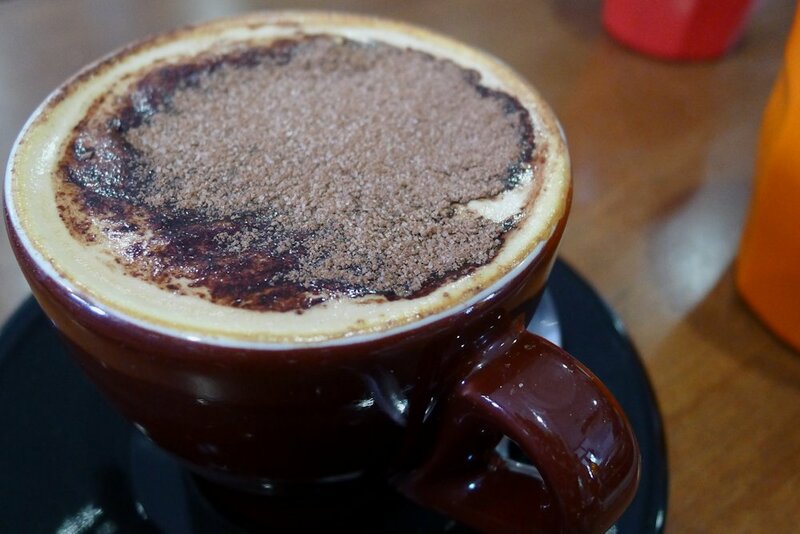 Coffee by Toby’s Estate, expertly prepared and it tasted fabulous. At $3 there is absolutely nothing to complain about! Affogato with house made ice cream and a wide variety of Rabbit Hole teas are all $4.50 each. Check with waitstaff or on their Facebook page to see what house made ice creams are currently available. 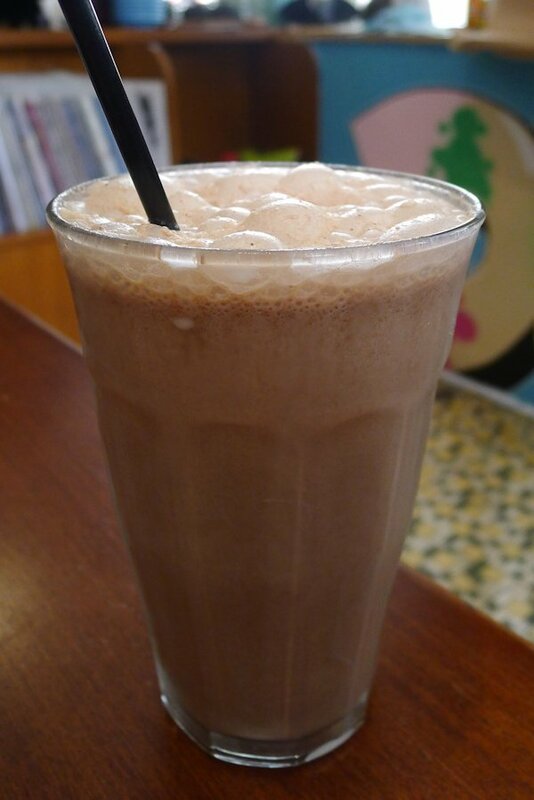 Whatever there is, you can add it to a milkshake ($6.50). I did try the main dish of fat stacked ricotta hotcakes with bacon ice cream (yes that’s right, bacon ice cream, $16) a few weeks ago. I enjoyed the ice cream but it is definitely an acquired taste. I’m now trying to imagine it in a shake! For the less adventurous there are the more common flavours such as chocolate, vanilla and mint choc chip. Either way, my chocolate shake was super chocolaty, it won’t disappoint. All it took was one of these going by to sway one of my guests to ordering the Cowbell 808 burger ($18). 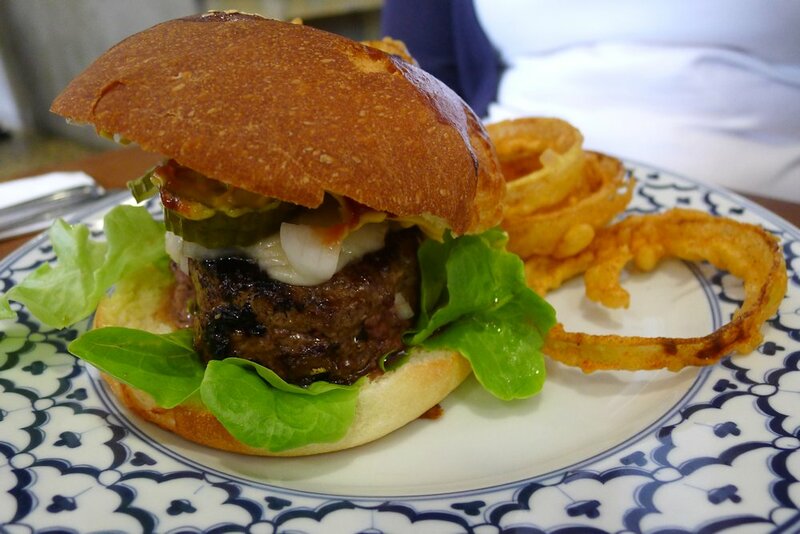 The patty is thick, juicy and tasty. There are some brightly coloured greens but they’re just for presentation… the abundant cheese, sweet pickles and classic tomato sauce/mustard combination on a slightly sweet and soft bun make this a winner. The spiced onion rings are too good to share! Gratuitous bacon shot! 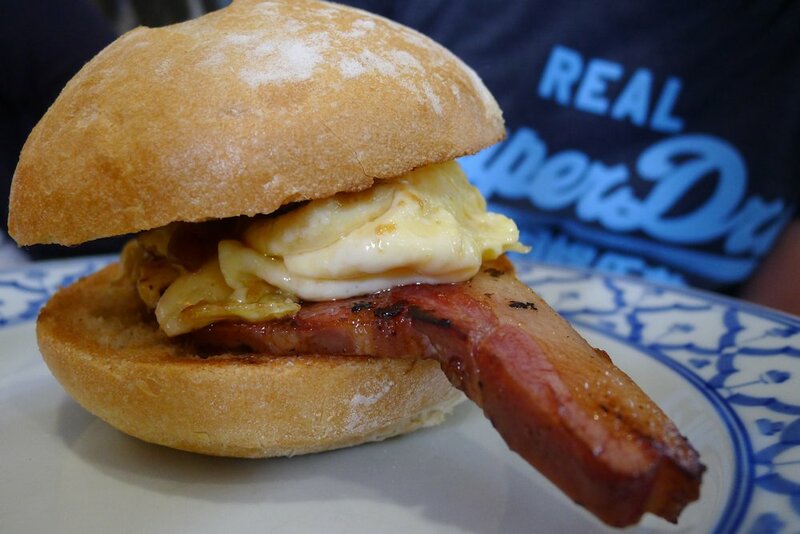 Take some thick cut house smoked bacon, scrambled egg, onions, BBQ relish and a tall but soft and fluffy bun and you have the aptly named bacon & egg sambo ($10). For my guest who considers himself a breakfast wrap, sandwich and roll expert, this rated very highly amongst others he has sampled. 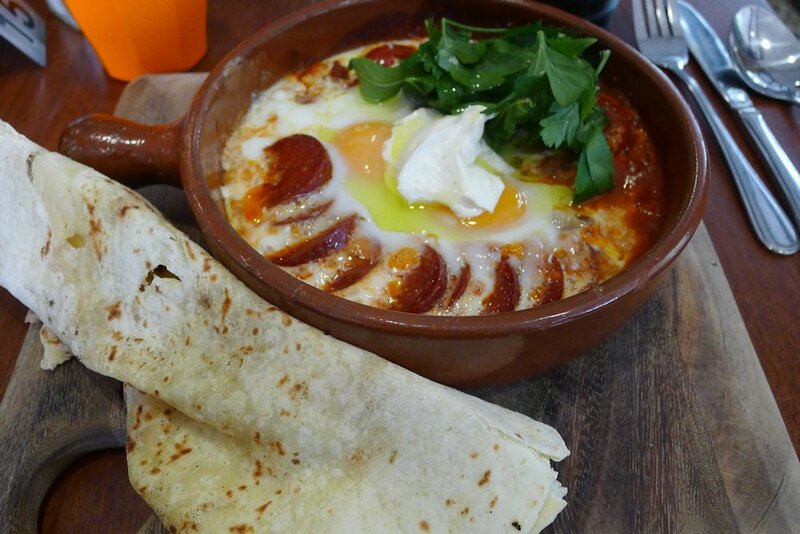 The sucuk baked eggs ($18) is also available in vegetarian form. The Turkish beef sausage (and the sauce itself) certainly pack a welcome spicy hit. The sauce was plentiful and worked well with the grilled flatbread which actually had a sweet hint to it. Labne on top has been done before but what the hell, it works so well! You know how I always say adding bacon can only improve a dish? Well even with Cowbell’s fantastic thick cut bacon, the grilled eggplant roll ($12) simply didn’t need it. We ordered the bacon extra expecting it to come on the side. It came within the dish which isn’t a criticism, that’s just how it was done. The majority of the flavour comes from eggplant and fried cauliflower. The cauliflower adds some crunchy consistency to the affair with hommous balancing out the flavours. It definitely tasted good but we all agreed that the other three dishes were the winners today. More dishes I’d like to return for are the house smoked ocean trout (with fennel slaw, pickled beats, fresh horseradosh and rye, $16), green apple bircher (with lime, coconut, yoghurt and fresh blueberries, $12) and the previously mentioned hotcakes with marscapone, bacon ice cream and espresso syrup ($16). If you aren’t keen for the bacon ice cream, ask for it without as these were probably the best hotcakes I’ve tried in all my reviews (perhaps marginally behind Morso, review 1, review 2). 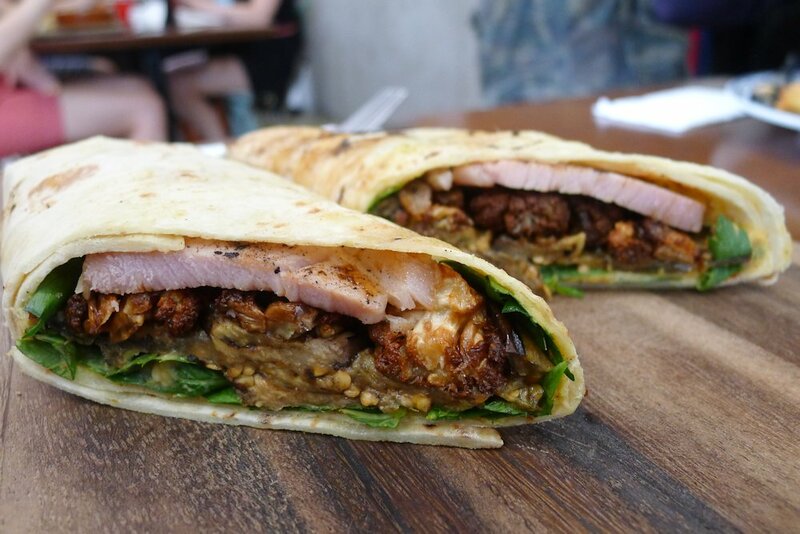 With an almost unmatched group of friendly staff and superb food, Cowbell 808 is certainly a standout and if you know the Surry Hills café scene, you’ll know that is a feat! 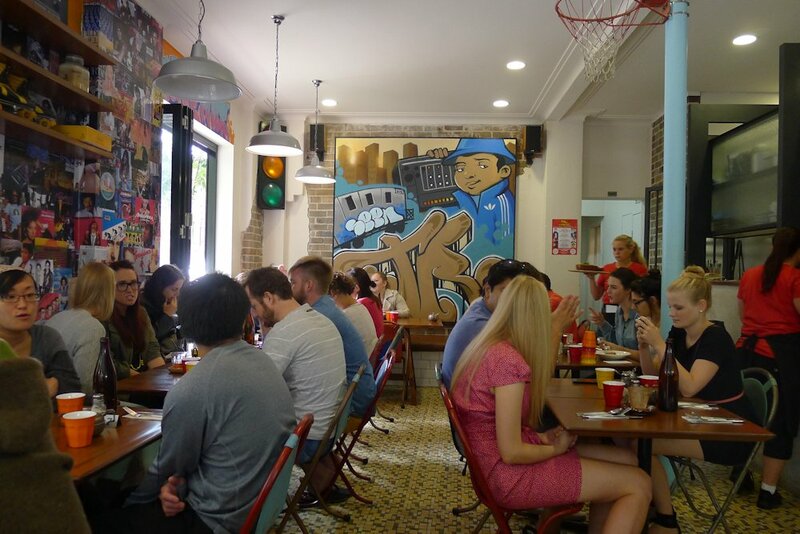 This entry was posted in Sydney - CBD, Sydney - Inner East and tagged Disabled access, Dog friendly, Free range eggs, Gluten free options, Outdoor seating, Parking close by. Bookmark the permalink.